For some time, I’ve known that people’s self-awareness is wildly off. People tend to think they’re patient, kind, competent, and charitable when, by default, we’re all the opposite. But besides not knowing our personalities well, no one seems to know what they actually look like. Nowhere is this more apparent than with Bitmojis. For several years, these cartoon versions of ourselves have existed. Users get to design mini-me’s that resemble ourselves as close as the options come. This gets as specific as your eyebrow shape and pupil width. And don’t forget lip plumpness! If you even have lips. That’s an option (no lips)! But do Bitmojis really resemble us? I first noticed this problem when my friend debuted her Bitmoji avatar in the spring. Now my friend is good looking, but she is Hermione attractive, not naughty schoolgirl attractive. However, her Bitmoji suggested otherwise. I have had my Bitmoji for over a year. I spent an hour sprawled on my bedroom floor debating my hairstyle (sideburns? scruff? how high is my hairline?) and measuring my jawline (sharp, pointed, dented??). I haven’t changed it since. Well, okay, I changed clothes in the summer, but long pants seemed unseasonably warm. Most people are familiar with the hotness scale. Arbitrary as it is, we all tend to fall between 1 and 10. Common wisdom dictates we can only date within a margin of error of 2 around our own score. The problem is, no one knows their own score. Some of us are cognizant that we’re not 10’s (most of us are not 10’s, me included). But also, we’re not 8’s either. I think I’m a solid 6.5. But I know some 4’s who think they’re a 7. And in Bitmoji world, they’re a 9. I cannot decide, do these people really think they’re a 9? Or is their Bitmoji their aspirational self? Are we supposed to project our better, future, nonexistent self into these cartoons? Did I miss that bulletin? And if so, are we allowed to use our hotter, pixelated self in our Tinder profile? Of course, Bitmoji is limiting. Do I have just a plain nose? Or is it slightly upturned? Very upturned? Flared nostrils? What about my eye detail? I definitely have some bags, thank you, PhD program, but I certainly don’t want to highlight these on my fictional self. Forget about face lines! I’m not admitting those until I’m 50. And as of late, I’ve begun sporting some stubble on my chin. But if I display this on my cartoon face, I look like an extra for The Hangover. Maybe I’m a liar just like all my friends. Maybe I don’t look like my Bitmoji self. When I voiced these thoughts to my friend Liz (who one day will have a blog post written about her), she compared this to the Sims pandemic of our childhood. Now I never owned The Sims (my parents didn’t buy me a video game until I was 14, gasp! ), but I sat beside many friends as they narrated their Sim(ple) lives. And I mean, isn’t that right? Every blonde-haired, blue-eyed guy looks like Matthew McConaughey (I had to Google his eye color, and on that website I was told he actually has “light brown” hair - like my own!). And if you’re a blonde female, I’m easily confusing you with Jennifer Lawrence. Everything else is pretty irrelevant for how one looks. It turns out a lot of people chose the Adonis body type. A lot of my friends in particular. 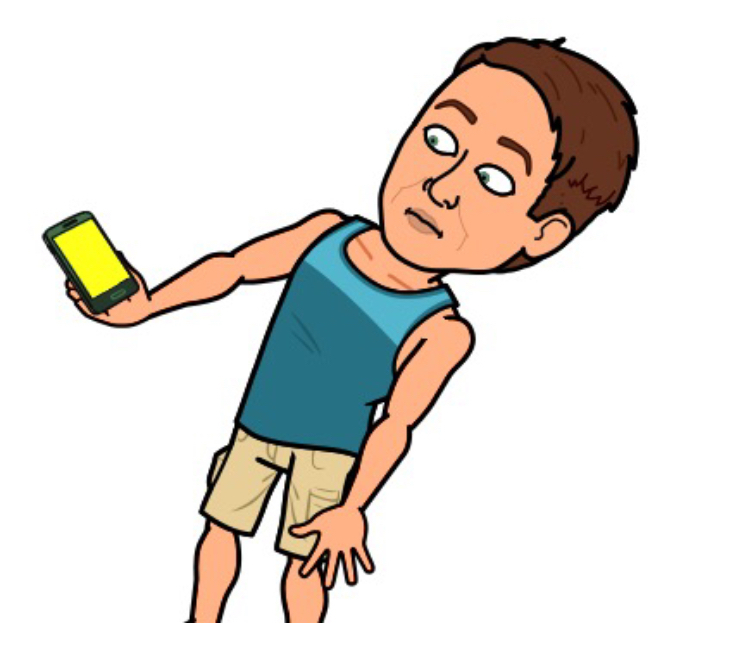 Bitmoji easily connects with Snapchat and other social media. If you remember, Snapchat rolled out a creepy map several months ago where you can track your friends’ whereabouts. Most of my friends are represented by Bitmojis. Upon first glance, I found myself staring at clones of myself. Huh? But I’m standing in the Fan. Why am I in the Museum District, too? And Scott’s Addition? And wait, I’m in DC too? Ohmigawd, we all look the same! I scrolled closer: Other than nose and no eye lines, my friend Chandler believes he’s my doppelganger. (Chandler is chilling in Bermuda while I write this; thanks for the FYI, Snapchat.) And my friend Chris is identical. Except if you stood Chris and I side-by-side…mm, you might know we’re not from the same family. In fact, Chris’s mom is Mexican. Slowly it dawned on me, all white males lacking facial hair look the same in Bitmoji world. Then even that theory got chucked out the window. Yesterday a friend emailed me asking for a favor. When I said yes, he sent back a thanks and included a Bitmoji of me. I wondered how he found my cartoon self, then realized it wasn’t me. It was my friend. His Bitmoji just had a little scruff where mine didn’t. But his Bitmoji self was even wearing my Bitmoji outfit! What the hell is this? This is not a brave new world. This is a Bitmoji clone world, and it needs to stop. We need to return to stick figure drawing. That, at least, would be more accurate.